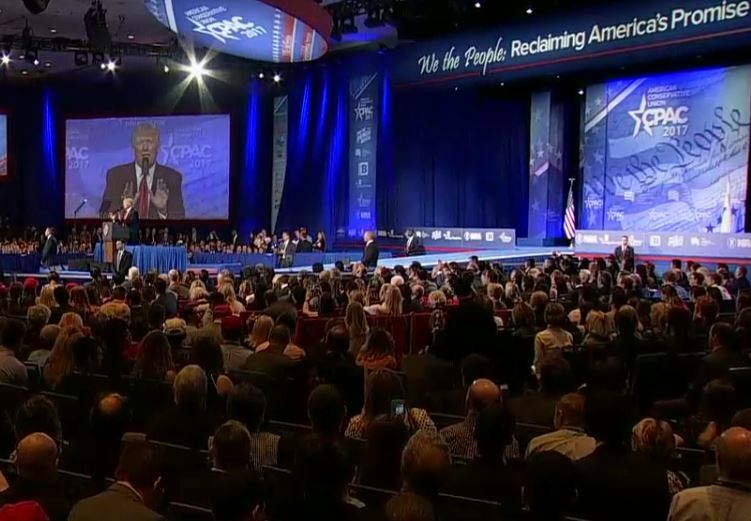 President Donald Trump spoke today at CPAC 2017 much to the thrill and enjoyment of those in attendance. President Trump began his speech by calling out the MSM and their fake news by asking the people in the audience to sit down as the media will say that Trump never got a standing ovation from CPAC. Trump added that they will forget to mention that those in attendance never sat down during his speech. ZING!!! Trump exposed the MSM and their fake news for not even being able to properly report the story where he said that fake news was the enemy of the people. The president stated, he is not against the media, he is against fake new. I am only against the fake news media or press. I’m against the people that make up stories and make up sources. They shouldn’t be allowed to use sources unless they use somebody’s name. Let their name be put out there. There are some great reporters out there. You have no idea how bad it is. You have a lot of them…the Clinton News Network is one. Trump said networks like CNN, ABC and CBS use fake polls to discourage voters from voting and to promote their own agenda. Via The Daily Caller, President Trump blisters the MSM and its fake news. Last night at CPAC 2017, Vice President Mike Pence brought down the house as his speech was met with thunderous cheers and applause. Pence joked that he was a little different from Trump as the president was known for his larger than life personality, his charm and his charisma, and he was not. Then came VP Pence’s best speeches to date. He literally brought down the house. Pence told the CPAC crowd that President Trump never quits, he never backs down, he is a fighter, he is a winner and I promise you he will never stop fighting until he makes America great again! Pence delivered his rallying cry as heated, at-times angry confrontations continue to erupt around the country between Republican members of Congress and constituents anxious about the GOP’s plans to dismantle the health care law. “Despite the best efforts of liberal activists at town halls, the American people know better. Obamacare has failed and Obamacare must go,” Pence said to applause here at the American Conservative Union’s annual conference. He dismissed the concerns expressed at town halls around the country that those covered through Obamacare could lose health care coverage as “fear-mongering from the left” and vowed there would be an “orderly transition” to a new health care system. Republicans are still working to formulate a replacement for the health care law, but Pence promised it would maintain protections for Americans with pre-existing conditions and allow the purchase of health care policies across state lines. He touted Trump’s plans to bulk up the US military, details of which are expected next week, and ticked down a list of crowd-favorite policies that riled the conservative crowd to their feet, including the administration’s anti-abortion agenda, its robust support for Israel and actions to end illegal immigration. But he made clear the administration would need to “fight” to achieve its goals — and he laid out the battle lines of that fight. “Our fight didn’t end on November 8. We won the day, make no mistake about it. The harder work, the more important work now lies ahead,” he said.